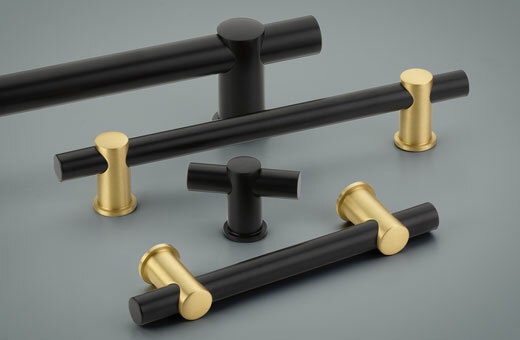 "Foncé" may be French for dark, but we think you'll agree that this new cabinet hardware collection has a bright future ahead with its stylish mixed metal and split finish options. 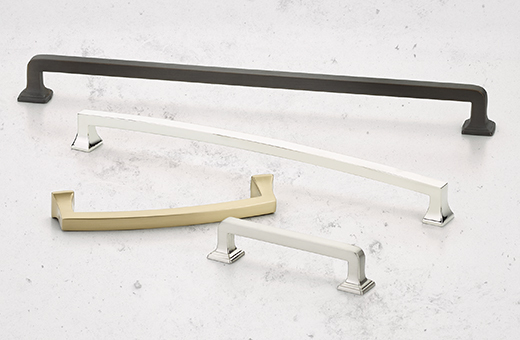 Available in five sizes and five finish combinations, the Foncé bar pull collection offers a contemporary yet unique look for your kitchen or bath. 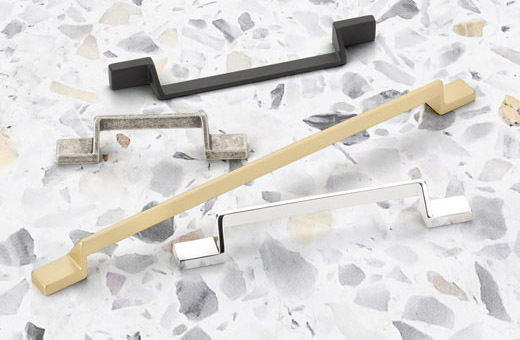 The San Marco cabinet pull collection embodies contemporary Italian design. Featuring a minimal profile, inspiration for this versatile pull is derived from the simple manufacturing forms of a vintage era, when metal was bent rather than molded. 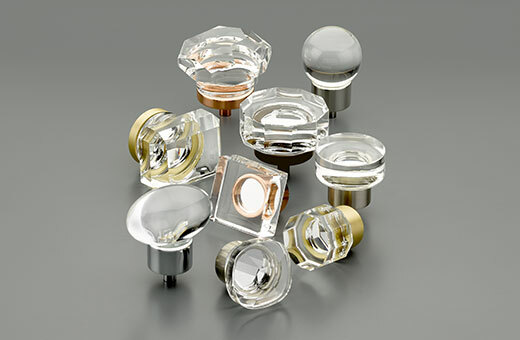 The City Lights Collection welcomes 9 new modern and faceted crystal shapes, available now! 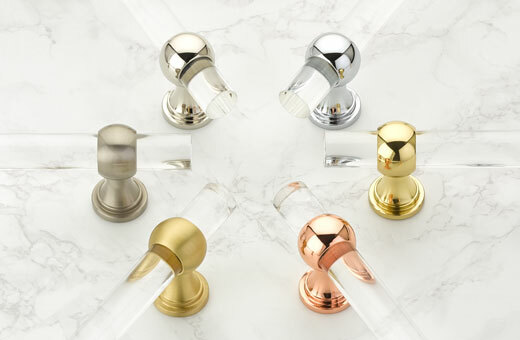 All styles come in Oil Rubbed Bronze, Satin Nickel, Polished Chrome, Polished Nickel, Satin Brass, plus the addition of the new Polished Rose Gold finish. A shapely update to our popular Lumiere collection, Lumiere Transitional offers a flared base with a stepped detail and a spherical fitting for the sleek acrylic bar. 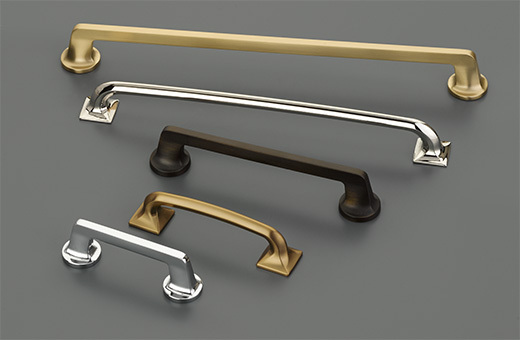 Now available in 6 finishes, a range of pull sizes with unique and adjustable center-to-center spacing, as well as in appliance pull options. 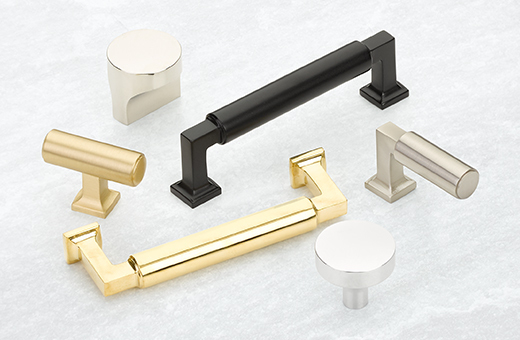 Among Schaub & Company's most popular transitional collections, Empire is now available in 3-1/2", 5", 6" 10", and 12" pulls! Among Schaub & Company's most popular transitional collections, Northport is now available in 3-1/2", 4", 6", 10", and 12" pulls! Our popular Menlo Park collection has been expanded to include 4 new sizes, available now. The 3-1/2", 5", 10", and 12" pulls will be offered in both the arched and stepped base cabinet pull styles within the Menlo Park collection, and in all 7 current finish options. 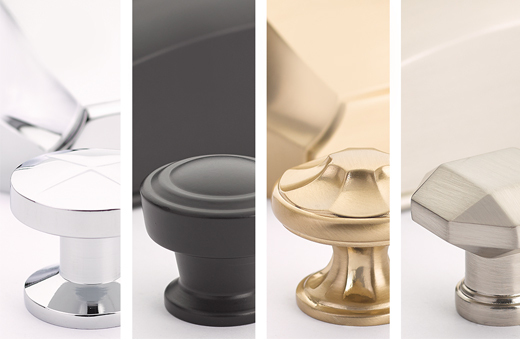 Schaub & Company is pleased to announce the launch of Haniburton, our latest cabinet hardware collection. The transitional flared foot provides an elegant, timeless look that's classic in both contemporary and traditional applications. Smaller pull styles offer versatile t-shaped and offset options, while Haniburton's two knob styles provide unadorned, disc-shaped profiles. 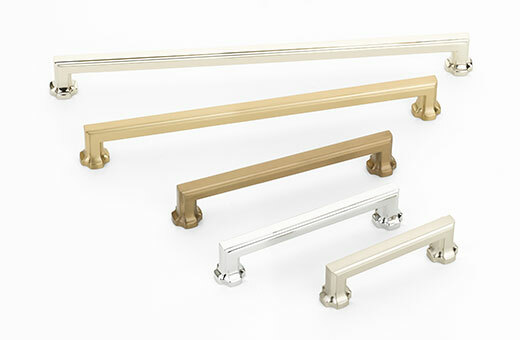 Schaub & Company's Lumiere Collection is now available in 12" center-to-center appliance pulls! 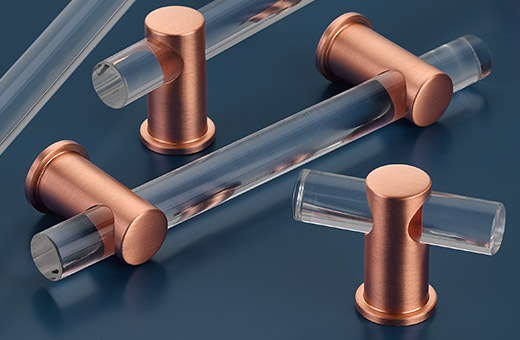 These new appliance pulls join the recently launched Rose Gold finish for the expanded Lumiere Collection, which also includes bases in Polished Nickel, Satin Brass, Flat Black, Oil Rubbed Bronze, and Polished Chrome. 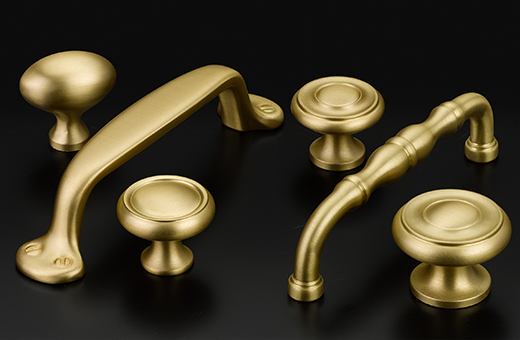 Schaub & Company is pleased to announce the expansion of our Satin Brass finish for the Country and Colonial Collections! The popular finish will be extended to all items within each collection, available today. 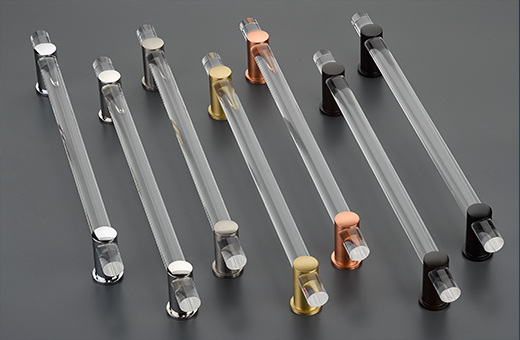 Schaub & Company is expanding our popular Lumiere adjustable acrylic cabinet hardware collection to include the new Brushed Rose Gold finish. This new stem finish option is available in T-knobs, 4”, 6” and 8” center-to-center pulls, with the option to easily adjust these measurements with an Allen wrench. We’re pleased to announce that we are expanding the finish options available in 3 of Schaub & Company’s most popular Transitional product collections! Schaub & Company is adding 2 new sizes to the popular Montcalm collection: 8” center-to-center pull and a 15” center-to-center appliance pull. This expansion will include the rope-style pull and the more ornate, traditional-style pull currently offered in the Montcalm collection. Six finish options are available.